SEOUL, SOUTH KOREA, March 14, 2019 – Noksapyeong subway station has been transformed into an art museum that combines public arts, natural light, and plants. Its gate that was located on the second basement level was lowered to the fourth basement level so that the entire space of the station is completely open to the citizens. With the art project, the station as one of the hot places in Seoul, which stretching from Itaewon, Haebangchon, and Gyeongridan-gil to Namsan Mountain and a future Yongsan Park, has been changed into a huge underground art garden. The Seoul Metropolitan Government and the Seoul Metro announced that they have completed one year-long construction for an art project at Noksapyeong Station and will have an opening ceremony from 10 a.m. on March 14. 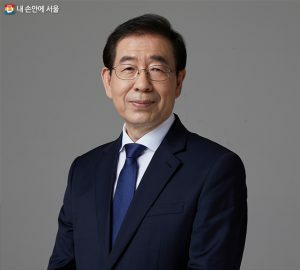 Around 100 people are expected to attend the opening ceremony, including Mayor Park Won-Soon and Chairman Ahn Gyu-Cheol of the city’s Public Art Committee. During the ceremony, participating artists will explain their public art works and production process. An archive exhibition will also be held. Once entering the station and going down to the fifth basement level, visitors are allowed to enjoy various artworks and an underground garden that utilizes unique, beautiful existing structures of the station. 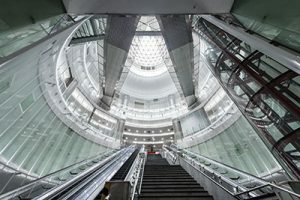 Noksapyeong Station on the subway 6 line opened in 2000 and features a large glass dome with a radius of 21 meters on the ceiling of the center and a beautiful main hall with natural light blazing down to the fourth basement level, and an escalator runs down in the center. It was planned to build as a transit station in accordance with the Seoul Metropolitan Government’s plan to replace its location. That is why this station was built on a larger scale than other subway stations. It was used as a place for wedding, movie, or drama shooting at the time of its opening. However, as the relocation plan of the city hall was canceled, the city government failed to find out other way to use it, so it has remained as a just regular transportation facility. An average of 15,000 people a day uses it. The 35-meter-deep main hall, the trademark of the station, has a thin metal curtain that reflects the sunlight coming through the glass dome on the ceiling, making the inside of the station a huge canvas that holds the light that changes every minute. When one goes up and down the escalator, one can feel as if one is in a different place whenever the light moves. Various artworks with the theme of “forest” have been placed at the waiting room on the fourth floor of the basement, which had been left as a passing space even though it was on a large area. On the ceiling, a knitted aluminum wire makes visitors feel as if it is in a green plant tunnel, and a piece of installation art makes ones feel as if they are walking on a mountain trail. On the platform located on the fifth basement level, the deepest space, vivid and warm colored artworks bright the space. The circular hall on the fourth basement floor, which used to be empty, has turned into a botanical garden where more than 600 plants grow. It will be not only used as a place where one visits and sees, but also serve as a place where citizen gardeners care plants and diverse hands-on gardening programs are available. Noksapyeong Station’s underground art garden consists of six public artworks made by seven world-renown artists and young artists home and abroad; an underground botanical garden; and a gallery, seminar rooms and other facilities that citizens are able to use. Public artworks are displayed along the floor going down from the first basement to the fifth floor with the theme of “light-forest-land.” Seven writers will present a total of six works exclusively for the Noksapyeong Station. The underground botanical garden was created at a circular hall on the fourth basement floor. During the daytime, natural light entering the glass dome of the ceiling adds specialty, offering comfort and relaxation to citizens. Citizen gardeners who are trained by the Seoul Metropolitan Government, will take care of some 600 plant pots and run various engagement programs. It will also be used as a hub space for plant-related programs organized by the Seoul Metropolitan Government’s city landscape division. The gallery on the first basement level and seminar rooms on the fourth basement level are newly created and will be used as a venue for exhibitions, art programs, lectures, presentations, and other occasions. Meanwhile, in the past six months prior to its official opening, seven artists had run various programs on the theme of cities, arts and plants as boom-up events, and about 3,000 citizens participated. Some of the representative programs include “Walking at Noksapyeong,” which connects Noksapyeong Station and the neighborhood of Yongsan; and counseling programs both for pets and plants. Among them, “Walking at Noksapyeong” will become a regular program from March 14. It is a walking tour program that starts at Noksapyeong station and ends at Yongsan Park Gallery. Anyone can participate the tour for free. Those interested may make reservation at the Seoul Metropolitan Government’s public service reservation website at yeyak.seoul.go.kr. It will run once a week (every Thursday) in March and twice a week (every Thursday and Saturday) from April. Meanwhile, the Noksapyeong Station Public Art Project is a new attempt to innovatively change an unused space. Artworks are naturally mangled with existing spaces like a background, and various spaces for the citizens are also prepared so that the entire station can become a piece of artwork as well as an art museum. As one of the “Seoul Is A Museum” project that began with the aim of making empty and unused transportation facilities cultural landmarks to provide the citizen with the beauty of nature and art. Through the public contest held in 2017, the Seoul Metropolitan Government and the Seoul Metro selected Noksapyeong Station as the subject of the project, set up a basic plan and started the construction in August last year. Noksapyeong Station is the closest station to Yongsan Park, which will be established on the site of the former U.S. military base. It has been selected as the target after comprehensive consideration of connectivity with urban parks, the scale of the station, and its potential capability of development. They studied architecture at Tokyo University and currently co-represent the Naruse Inokuma Architects. Renown works including ‘LT Josai’ that won the Best New Architect of Architectural Institute of Japan and JIA Architecture Award in 2015 and ‘Cafe riku’ to save northeastern Japan earthquake region. They participated in Korea-Japan Architecture Fair held in Seoul in 2012.